I just read a great post here. I am curious about content of "An example with images" in that post. If the hidden states mean a lot of features of the original picture and getting closer to final result, using dimension reduction on hidden states should provide better result than the original raw pixels, I think. Hence, I tried it on mnist digits with 2 hidden layers of 256 unit NN, using T-SNE for dimension reduction; the result is far from ideal. From left to right, top to bot, they are raw pixels, second hidden layer and final prediction. Can anyone explain that? Browse other questions tagged machine-learning neural-networks dimensionality-reduction tsne or ask your own question. Does Deep network (e.g. # of hidden layer=2) always better than shallow network (i.e. # of hidden layer=1)? Seeking to interrogate aggregate results, but more explanatory variables than result sets - do I need to consider dimension reduction? 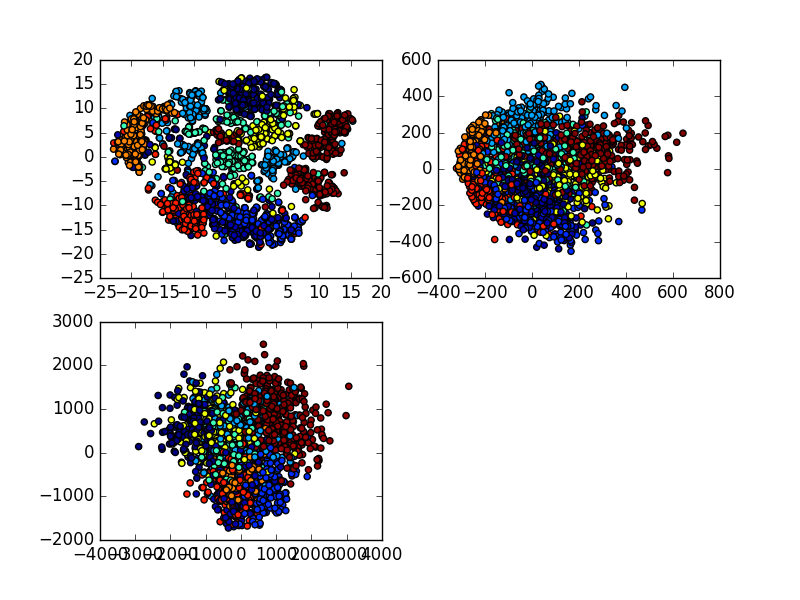 Neural networks - how can I interpret what a hidden layer is doing to my data?